It's been awhile since we answered your questions. You have many burning questions, quite a few of are the dirty variety and we're worried that you've been left hanging all this time. We've answered this one before, but it's worth addressing again, because it seems that there is still confusion about this Extremely Important Subject. 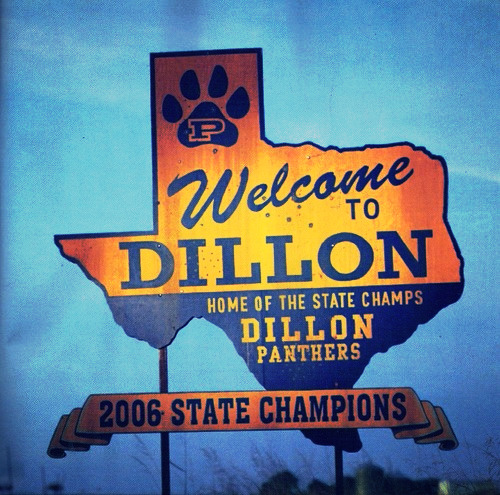 Tim Riggins is one of the major characters in the Greatest Television Show of All Time, Friday Night Lights. Stephanie Doyle at Drunk Author Talk wrote a fabulous post a couple of years ago contending that Tim is the greatest romantic hero of all time and that's a pretty reasonable argument. His character arc is incredibly compelling and you'll find yourself forgetting that he's not actually real. "A love poem that means everything." I don't know about a singular poem that can mean everything about love, but I'm a big fan of Pablo Neruda's Twenty Love Poems and a Song of Despair for all your love poem needs. What were the Printz Award Winners? You can find all of the winners and honorees from past years on the American Library Association website. I'm totally judging you right now. In our hearts. Forever and always. Also: The A.V. Club visited a number of locations in Austin, Texas that served as locations for Dillon--it's definitely worth a watch. The Tumblr Friday Night Sights chronicles all the of locales the show filmed at as well; I'm totally going on a pilgrimage sometime. Feb 22 Links + Things: Blogging Ethics; SI's Sexism and Racism; Indie Booksellers Sue Amazon/Publishers; and Taking Down "The Following"